Sometimes we depend upon teachers to help with certain events outside the classroom teaching environment. Chaperoning at your school parties can be one of those duties. 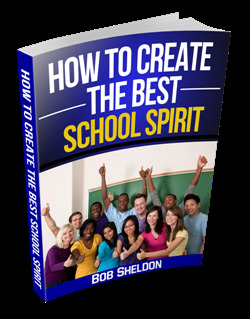 Schools can use themes to help develop and promote your school spirit. And theme parties are popular ways to encourage student participation and make everyone feel they have a role in creating a "fun times" environment. Sometimes a teacher is the staff representative on your school theme party committee. It is an important task because let's face it... picking the best theme can really make the good times roll. Even though teachers assigned to theme selection committees may not repeat that duty, and new teachers working with new students have to learn the ropes... it's important that school administrators always share how significant theme party planning can be. After all... it's all about your school spirit ! Students may have their hearts in the right place but they often need direction. They may not understand how a well chosen theme can impact your entire staff, in fact the entire education community. Learning how to plan and conduct a theme party comes with training and experience. Yes, most of us think anyone can throw a party. But this isn't just any party ! The difference is an effective theme party brings together the best... and they come from a diverse group of students and staff. They all want your school to be the best ! Your theme party planners can consider school values, goals, current events, future plans, special personalities, former teachers, administrators, school traditions,community involvement and what party supplies might be needed. Your party planners have several goals to be kept in mind. It may appear that a simple party is being turned into a serious classroom experience... but this is an opportunity to fullfill a meaningful purpose. With limited funds and time... it can often be a challenge to deliver everything you'd like to... at your theme party. It's often not feasible nor affordable to accomplish everything. So using a little imagination about your priorities and available funding might be in order. What would you like to hear them talking about the next day ? What items could you include that might be remembered in your yearbook ? These are the kinds of things to consider when you have to cut some corners. That doesn’t mean your school theme party still won't be a lot of fun. It just means school budgets are a fact of life... and we need to plan accordingly. It's the biggest bang for the buck that we want and with a little creativity... not much will be given up or lost. Teachers do have a heavy workload. And every minute of their school day is accounted for. Planning a school theme party just adds to their busy schedule. Yet, this is an important addition even though we tend to think of parties as little more than just entertainment. Your theme parties offer the chance for all to promote school activities while sharing in responsible, yet fun times. And because your school theme party can take place wherever you choose, students get the chance to hone their creativity and planning skills. 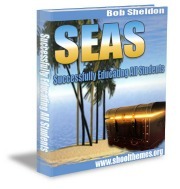 It can be in the classroom, the dining room, the gym, or even outside school. Students will have lots of fun with this option. Your school party is an outlet for emotion and enthusiasm... much like a pep rally. Teachers on the party committee can help channel that energy into the right spots. A school theme party is a great opportunity for teachers and students to join forces on a common project and show their stuff ! 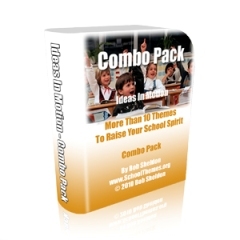 There are many ways to incorporate a school theme. Party Theme planning should try to include your school's unique culture and personality. Leave School Theme Party and Get Your School Theme!